But looking at both type of indicators, could anybody tell how the confusion is possible? In both models, if you see the indicators turning your head right (as if you were sat on the plane's seat), both show that the right wing is "touching" ground. That means that you are clearly rolling right. How can a pilot interpret that the plane is rolling left? It's so easy to sit in our comfy lounge chairs and wonder how on Earth pilots get things wrong. The error didn't happen without context. It was dark. There was little to no external visual reference due to cloud. The pilots were manually flying in a busy phase of flight. And the captain was probably adversely influenced by a medication/opioid. Even without the artificial horizon mixup, the conditions were ripe for spatial disorientation. This image is taken from this short video (yellow arrows were added). It demonstrates how a left turn on the Soviet display is similar to a right turn in a Western display. The captain was used to the left display, where if the main line of focus was angled to the left, that would mean he needs to make a right control input to go back to wings level. In the accident flight, he saw that the most predominant line - the horizon on the Western display - was angled to the left. Due to the context I've mentioned, he went back to his basic knowledge - that a left angle means I need to make a right control input. Of course, if he was on top of his game, he would have remembered that even on the Soviet indicator, the artificial horizon should have been level. But by this point he was already disoriented and confused, with the first officer's instructions ambiguous and worsening his dilemma. 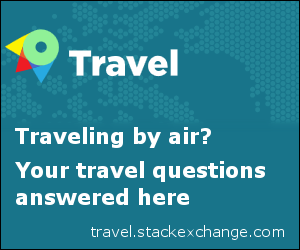 Just adding few more points to already existing answers. I agree with previous commenters - some understanding of pilot perception and context is needed. 1) Both instruments are tilted to the right side on your original image. This is, however, not how pilots would see the Attitude Indicator (the instrument itself). Even if the aircraft banks, pilots do not tilt their heads. In fact, in smooth coordinated turn without outside visual clues, you won't notice that your aircraft is actually banking to the side. Your body will sense that you are perfectly level, because at the same time the lift component has been also increased. 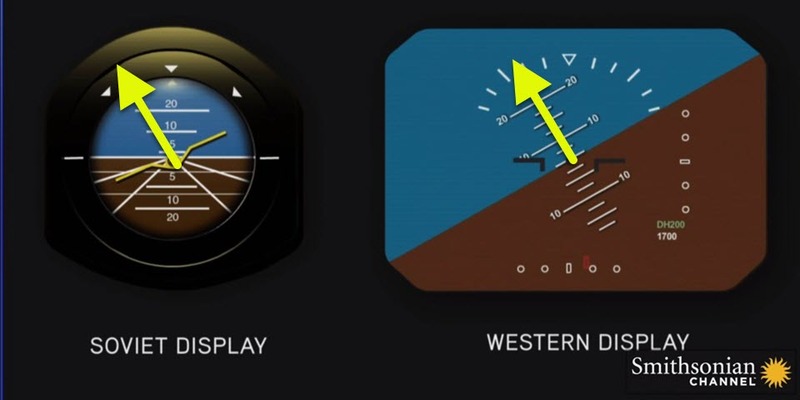 2) On a real Western digital Attitude Indicator (display), that little aircraft silhouette in the middle might not be very distinct, as depicted on your original image. It can be also obstructed by Flight Director bars. As Ben pointed out, the most predominant line you might see is the horizon line. The horizon line is what's moving on a Western instrument, and this is what might confuse pilot. In contrast, on the Russian instrument, the aircraft silhouette is moving in front of a static horizon. To better illustrate your question, I'm attaching this image to show 2 different ways of displaying an aircraft during banking. The upper instrument is the Western display, the bottom one is the "Russian". Both instruments are showing roughly 30 degrees banking to the left, but in two completely different ways. I'm not a professional pilot on a large glass cockpit aircraft, but I have PPL with some Instrument flight time logged, and find that "Russian AI" might be more intuitive and easy to read in some situations. 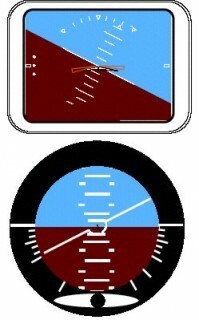 As an example, if pilot must perform sudden and unexpected upset recovery, to correct the attitude, he might be misled by very predominant diagonal horizon line on the Western display. 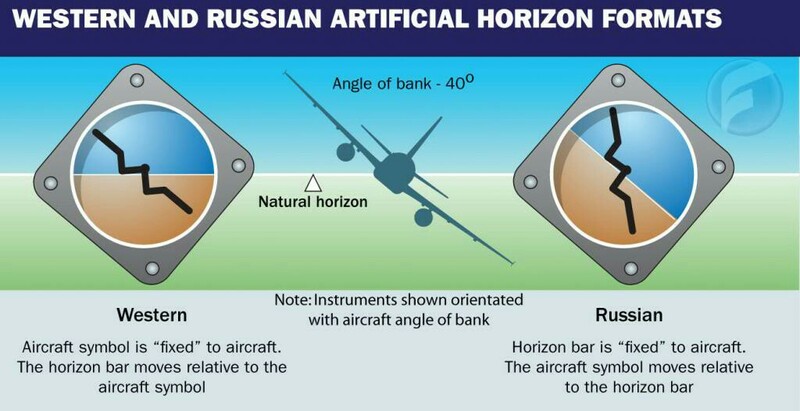 The problem is - it's the horizon line which changed its position in relation to the Western AI display. Consequently, pilot under stress and / or "tunnel vision" might want to return the horizon line back to it's original position by turning the yoke in the wrong direction, with potential catastrophic consequences. Adding to @Ben's answer, another source of confusion when it comes to human factors is even present within Western attitude indicators. 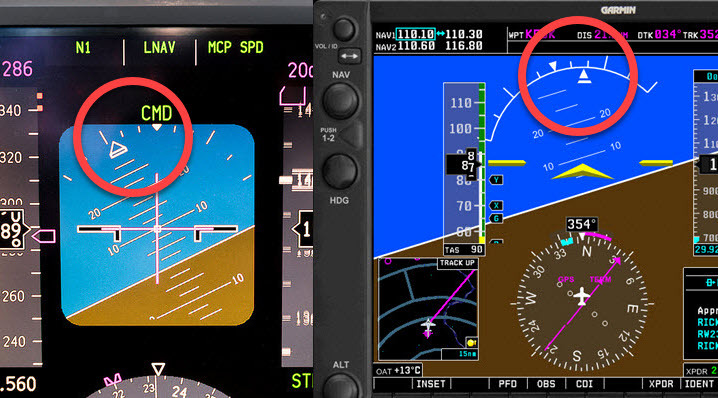 Boeing and Airbus aircraft use the style on the left, whereas Garmin (and mechanical gyros in light aircraft) the style on the right. Note the roll angle and its indicator in a right turn above for both styles. This can add to the confusion when compared with the Russian style. The basic premise has been mentioned by everyone above: the basic instinct is to 'right the wrong', and if we see some indication tilted left, we instinctively want to move it right. It's possible to train for everything, but in stressful or confusing situations instincts will take over, it's just a question when. The reverse ('Russian') indication didn't appear just out of the sense of opposition to the West; it was a product of extensive research. It's been proven that pilots make less mistakes with the reverse indication, from lab tests to the statistics of successful spiral dive recoveries. Conversely, the direct ('Western') indication is more the result of gradual evolution: early AH had a gyro right in the central ball (or directly connected to it) that represents the horizon, and it naturally kept the 'true' horizon line. (Except that sky and ground were reversed, with the blue or white half at the bottom). And after all, it's just 'obvious' that Artificial Horizon should show, well, horizon! But there is one more dimension to it. The mental picture of motion is different for different people. Some (apparently, about half or even the majority of) people perceive it better as them being at the origin and the world moving around them. This corresponds to the direct ('Western') indication, and such people must adapt to it more naturally. They also tend to use maps with 'track up' orientation. Others view (or can easily imagine) themselves from the third person view, and they are more at home with the reverse (and 'north up') display. There was a research (I'd need to find a reference, but it will probably be in Russian) that fighter pilots with this second type of mind perform better in a dogfight. I think the biggest factor is that under intense stress where the "mental tunnel vision" effect starts to take hold (I've had that experience in the simulator) you revert more and more to your most base line and strongest mental foundations (and if they aren't there you simply freeze). So, while it may seem easy-peasy to adapt to, until the western format has been internalized as deeply as the Russian one, there can be a tendency to start to mentally revert, causing more mental conflict and accelerating the mental tunnel vision effect, ending up in mental freeze mode. Not the answer you're looking for? Browse other questions tagged flight-instruments attitude human-factors roll or ask your own question. Are there (ideas for) GNSS based attitude indicators?